The New Baader Planetarium Calcium K-Line Filter makes imaging of the sun in K-Line accessible to anyone with a telescope and digital camera or webcam. 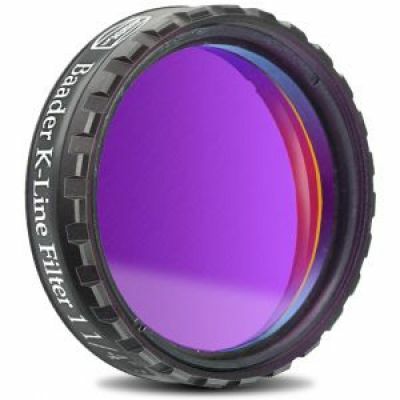 Baader's innovative double-stacked filter uses sophisticated coatings to produce a sharp 8nm wide bandpass, the filter shows two lines at 393 nm and 396 nm thus, one obtains a deep blue image of the showing solar flares and dark spots across the entire surface of the sun. WARNING - THIS FILTER IS FOR PHOTO USE ONLY AND NOT VISUAL. ATTEMPTING TO OBSERVE THE SUN BY LOOKING THROUGH THIS FILTER ALONE CAN RESULT IN SEVERE EYE DAMAGE OR EVEN BLINDNESS, THEREFORE INCLUDED IS A4 SHEET OF ASTROSOLAR MATERIAL TO USE ALONGSIDE.